These photos are copyright 1998 and 2012 by Lou Cross and may not be reproduced in any form without permission. 1. 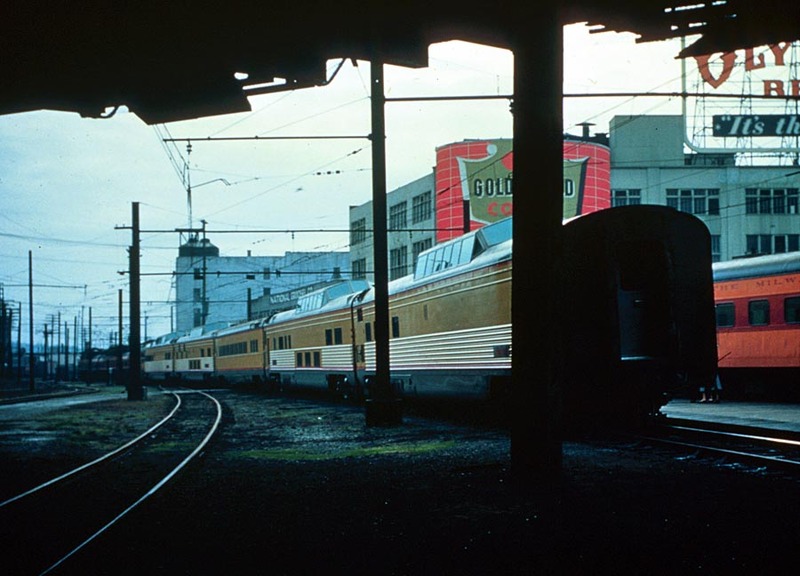 On June 18, 1950 UP assigned the former General Motors Train of Tomorrow Astra Dome cars to Trains 457 and 458, which made a daily Portland-Seattle round trip. 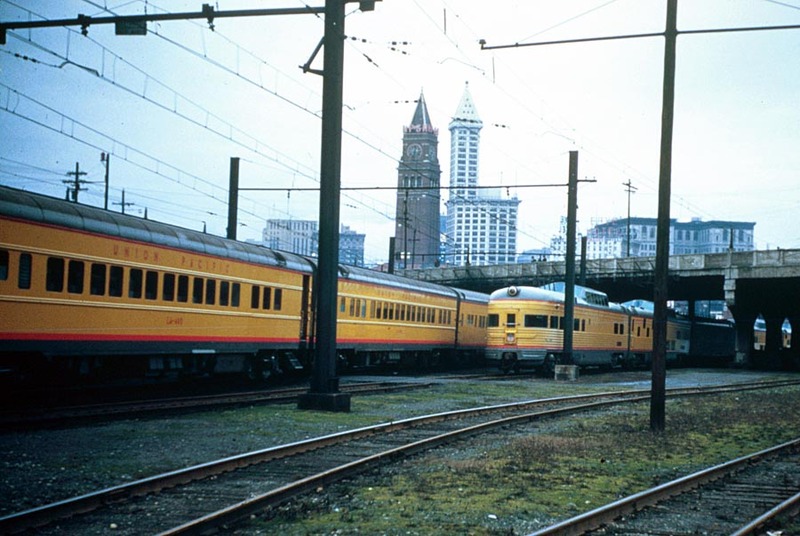 The popular train was usually too long for the platforms at Seattle's Union Station so the rear of the train would be uncoupled and shoved onto an adjacent track, as shown in this photo. The first two dome cars are a diner (Sky View) and a chair car (Star Dust). 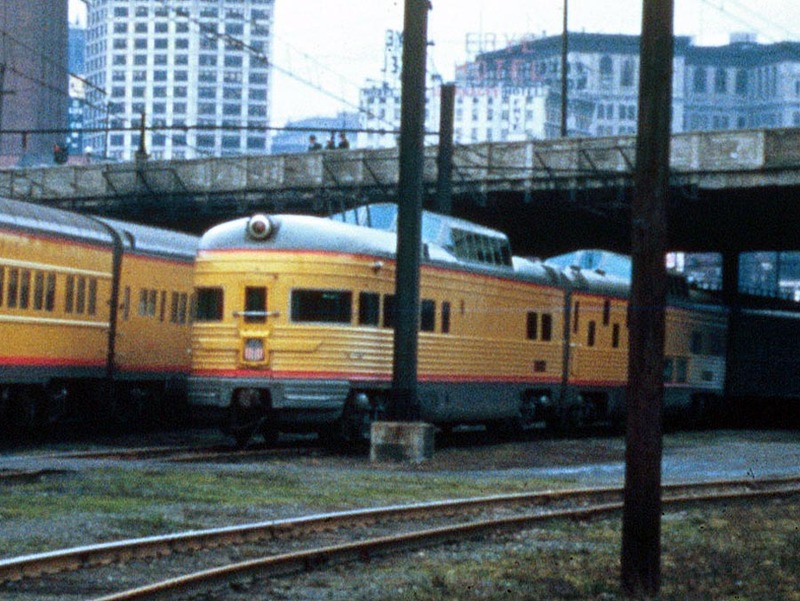 The two dome cars on the rear are a sleeper (Dream Cloud; operating as a parlor car) and an observation (Moon Glow). To the right is the Milwaukee Road's Olympian Hiawatha. 2. Here we see the Astra Dome observation. The coaches on the left are former Challenger cars and were a mainstay on Trains 457 and 458 until the late 1960s. In the distance is the Smith Tower, at the time the tallest building in the U.S. west of the Mississippi River. The brick tower to the left of the Smith Tower is part of King Street Station. It was adjacent to Union Station and served the Great Northern and Northern Pacific Railroads. 3. This is a close-up view of the center of the previous photo showing the observation Moon Glow. The Astra Dome cars operated on Trains 457 and 458 until the early 1960s when they were gradually withdrawn. The first to go was the diner Sky View. It was retired in February 1961. The last to operate was Dream Cloud, the dome sleepr. It was the lone remaining dome car listed in the March 1, 1962 timetable.